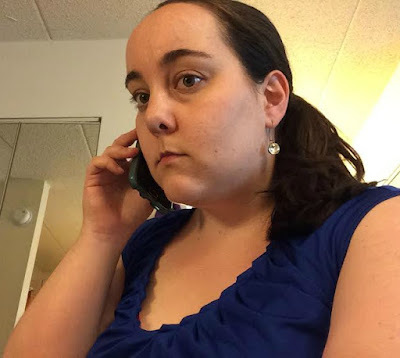 *Disclosure: I received a complimentary meal from Dickey's in exchange for this post. The opinions expressed here, however, are my own. 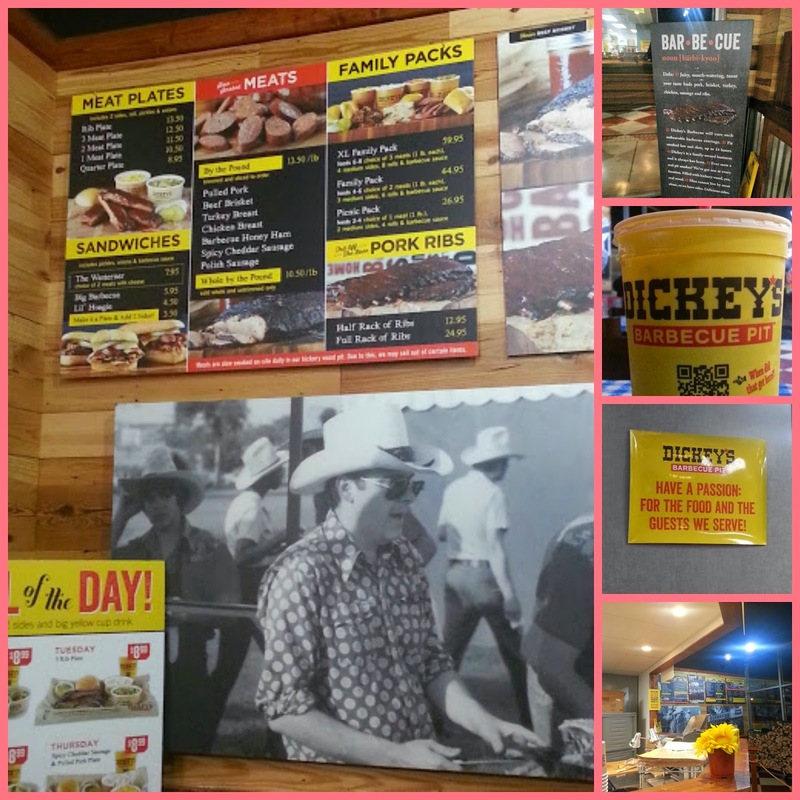 I had the pleasure of dining with a few other blogger friends at Dickey's Barbecue Pit in Ferndale this past week. 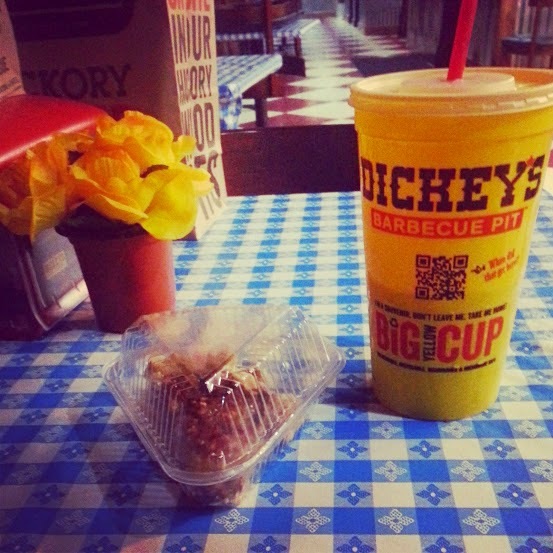 This was my first time eating at Dickey's, and I was excited to try it out. 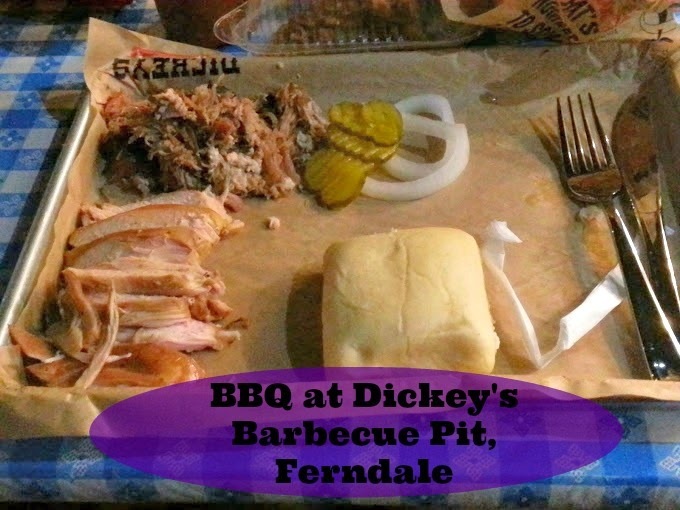 Dickey's has a number of locations, and we dined at the downtown Ferndale, MI locale (on Woodward near 9 Mile). 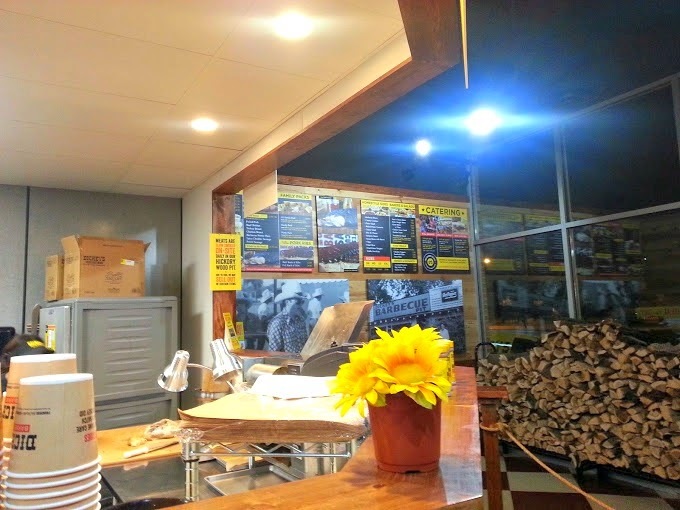 The first thing you might notice as you walk in is the HUGE pile of chopped firewood near the door - these are used for the smokers, to make sure your BBQ is delicious. We could choose either a sandwich or a meat plate, so I chose the two-meat plate, with chicken and pulled pork. The pulled pork was a little "fattier" than I normally would like, but the chicken was delicious. For my sides, I chose the Fried Onion Tanglers, as well as the Waffle Iron Fries - both were great (I'm a sucker for waffle fries, usually) but if I could only choose one, I'd choose the onion tanglers - they were salty and delicious. You first order and pay in the line area, and then you can grab your BBQ sauce (spicy, sweet, or regular - or all three, if you like) next to that area. A two-meat plate, with two sides, is only $11.50, which really impressed me. I've been to other barbecue places in the area which are a lot pricier than that, and what's nice about Dickey's is that there's no tipping since it's essentially counter/self-serve. Dickey's also has free ice cream (yes, you read that correctly - FREE. ICE. CREAM. ), in the form of soft-serve, that's available anytime, and it's also dairy-free - yet still tastes great - which I really liked. Dickey's has a few options and I chose a slice of pecan pie, since pecan is my favorite type of pie. I was so full from my meal that I brought it home and enjoyed it the next day. I could definitely see adding some of the free soft-serve on top and making it pie a la mode, too. 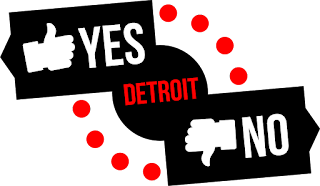 Dickey's is a nationwide chain, and it has a few locations in the metro Detroit area. The Troy location is pretty close to the new MJR Troy Grand theater, as well, and would make a great pre- or post-movie meal. Rochester Hills: 1418 N. Rochester Rd. Clinton Twp. : 41700 Garfield Rd. Macomb (coming soon): 20761 Hall Rd. Commerce Township: 4825 Carroll Lake Rd. Plymouth: 44741 Five Mile Rd. I have a coupon for you to use when you go, as well - a BOGO (buy one adult entree and a drink, get one adult entree free), as well as $5 off the purchase of an XL family pack. Both are valid at the Ferndale, MI location only and expire on November 15, 2014. You can either print the coupon out or show it on your mobile device while ordering. 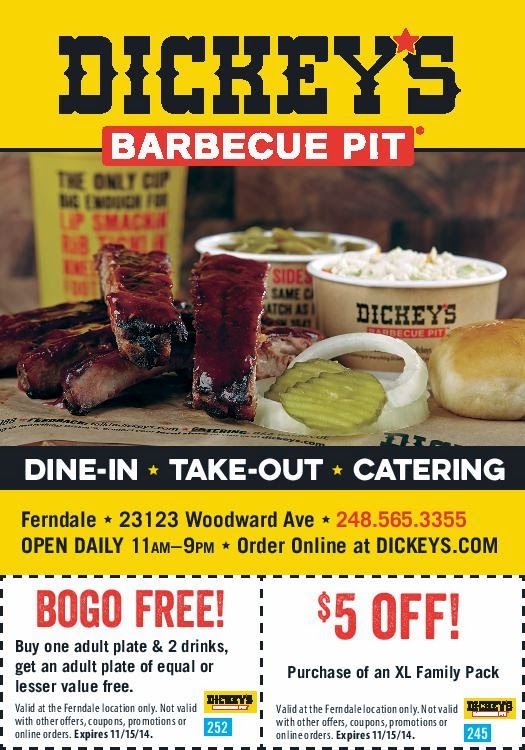 Also for Ferndale only: you can text DICKEYS934 to 25328, and you will receive a text to get a FREE fountain drink in a big yellow cup, with a purchase.